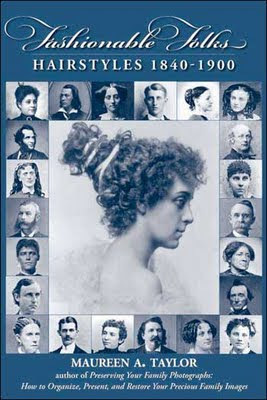 Maureen Taylor's book Fashionable Folks, Hairstyles 1840 - 1900 is now available on LuLu. The Print On Demand website is offering this "must have" photographic dating resource at a fantastic price. I've ordered mine! The following is an excerpt from the book's back cover. Is there anyone who hasn’t had a bad hair day or obsessed about the right hairdo for a special event? Probably not, and this obsession is far from a modern phenomenon. Fussing over our hair is one of the things that link us to our ancestors. Maureen Taylor, the Photo Detective, has studied the many fascinating details in nineteenth-century pictures. Early portraits tell us so much about the society, the times, and the trends, and the individuals they feature. And it’s often the hair that stands out. Short, long, curled and coiffed manes were as trendy as the dresses and suits worn in each period. Every fashion era had its distinctive hairstyle – functional or fanciful. Using the clues explained in this book, you can learn a surprising amount about your ancestors by studying their portraits. How they wore their locks for the photographer – whether straight or curled, clean-shaven or fringed, oiled or bewigged – will tell you a lot about them. Maureen Taylor’s tips for “reading” the clues of clothing and hairstyles will help you discover when those pictures were taken, how old the subjects were at the time, and how wealthy they were. You can't go wrong with a book authored by Maureen Taylor.